Actor Olivier Lafont’s roots are French (actually he is of mixed origin) but his understanding of Indian mythology is excellent. And, he is a very good writer. His command over English language is fantastic. He has written many books. Let us share our personal Views and Review for one of his books Warrior. It is tough to read this book and not become fan of his writing. The book is comparatively long read, it is spread over in 3 parts. The book explores the concept of Pralaya which western authors refer as “the Dooms Day”. Most of the western writing about the Dooms Day explores the events on the last day of the Earth from their point of view. This book is set in India (or Bharat) and the Dooms Day is explored from Indian perspective. We however wondered why the author doesn’t use the word Pralaya (प्रलय) very promptly in entire first segment. Saam is the protagonist of the story. He is a young man living in Mumbai. He is almost a part of the crowd and there is nothing special to distinguish him from the crowd, of course apart from his healthy body; but that is common to find among many health worshiping people. Maya is his love interest and Laalbal is one of his friends, or we can say is his best friend to an extent. The weather of the city (and eventually entire country, leading to entire world) has started changing mysteriously. So naturally everyone started fearing about the end of the world! Is it to be soon? It surely is time. And there is only one person who can save earth from that. Who else but Saam!!! One of his secrets starts unraveling, and he is revealed as the only demigod son of Shiva – The God, The Ultimate Destroyer. (Reminded us of the very popular western concept where Greko-Roman Gods meet with earthlings to have demigod children, e.g., Percy Jackson). If the end of the world is inevitable, only one force can do it. Lord Shiva himself. And trying to save Earth and fellow human beings is, challenging Lord Shiva himself! Will Saam succeed in his mission? What will be the fate of the Earth and species living here; is better to be explored in the book. We sincerely believe that reviewing a book is quite easy compared to writing it. And it is true for almost anything we come across. There is a lot of effort invested in any remarkable creation. And, it may not be right to judge it flippantly or give a few out of some stars or something like that. However we also believe that a genuine review helps other people of similar mindset to decide whether to invest their time and money in a specific piece of art or literature (i.e. the book here) or not. 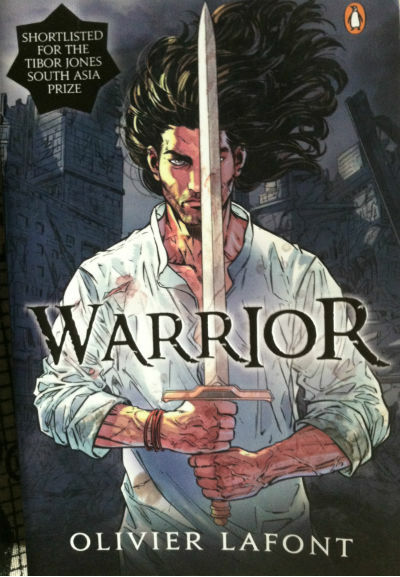 So, here are our views and reviews for Warrior. The cover page is quite attractive without a doubt. However as it is associated with Indian mythologies, many viewers have commented that the warrior shown on the cover should look more Indian. We personally feel that if the cover had gone the way like for Amish Tripathi‘s books; i.e. a well built model (i.e. real human being) appeared on the cover. And if needed, the face of the fellow could have been hidden. We will try to restrict the content detail in a way that we don’t discuss spoilers which may ruin your experience when you actually read the book. When exploring mythological stuff, you can go wrong if you haven’t studied it properly. Olivier has French root, but it, in no way, prevents him from writing a fantastic book. And we consider this is because of his vast reading. He has lived in Mumbai for many years, long enough to have actually absorbed the Indian culture pretty well. And his love for Mumbai is clearly shown when he writes about the city. He has explored it in many ways in the book, and you start liking the author’s observatory powers. Also, there are chances to mess up things while you are dealing with so many different threads and trying to weave it all together to create a coherent story. Olivier remains brilliantly on the top of the events with full control. He also has described some other places of India remarkably well in the book. When he writes about Ahmedabad, Gujarat then also you will find him writing it equally convincing for that matter. The concept of multiverse is simple,: an infinity of universes layered one upon another each one as close to the next as the width of a substance particle, but forever separate. Think of it as an infinite reflection of our world, like two mirrors placed opposite each other. Who knows what they ever think? For them the multiverse is a part of their being. Might as well ask a mortal why they’re alive. For the gods, maybe the multiverse simply is, and cannot be rationalized and explained in words. And his narration about Gods and Demigods, through the thoughts of Saam, is very simple and effective. People change every day. Gods certainly don’t, but demigods must inherit some virtue from their mortal parent? Olivier made sure that his characters are detailed pretty well. The following lines tell us that once Saam made up his mind, he didn’t want to sidetrack from his mission. He knows what is important and what is not, what is to be done and what are the priorities. No need to get mired in a domestic squabble when the fate of the earth teetered on a knife’s edge. The way locales are explored, it sometimes give you a feeling that you are walking through them. It definitely a plus to the author for creating the right ambiance. The most interesting part of the book is how it captures the typical human attributes and aspects. The Gods can be pure, but the humans cannot be. Our brain forces us to look at life differently in different situations. And when you talk about DemiGod, they inherit some of this for sure. So, there can be sibling rivalry or jealousy or betrayal and other aspects even the DemiGods also suffer from. Remember, the conflict which affected Thor and Loki, Hercules, etc. in Greek mythology? Sam has Ara, his half brother, who shares a love/hate relationship with him. Some of the nice dialog are given to Ara also which requires a mention. Maya’s character is also built nicely. The twists come in the story pretty effectively, especially in second and third part. The climax is definitely worth to go for. There are a few letdowns also. The mythologies are mixed in a way that enthusiasts who have remarkable knowledge might find some stuff is represented wrongly. However, we must say that as it is not a modern day adaptation of a specific stuff, author can freely do it. The beginning is not very effective. Actually it takes off pretty well, but then for some chapters it becomes rough riding. Its in middle of the book that it starts to become interesting again. Also, author could have glossary of terminology and references at the end, as an added benefit. However, we don’t consider it as a letdown. These days there is offensive marketing going on for each and every book hitting the market. One part of it, is having book trailers. Might be due to limited budget (or extensive content) or some other factors the book doesn’t have the luxury of having book trailer. If you are interested in mythology and love to indulge in a little complicated read where so many things are happening, you will definitely enjoy the book. Initial pages of the book are not that much gluing, but once you are little more acquainted with the story, it is a nice ride throughout. Definitely a recommended read. The book also has potential to be converted into a TV Series with some script changes.